See the rest of the image here. 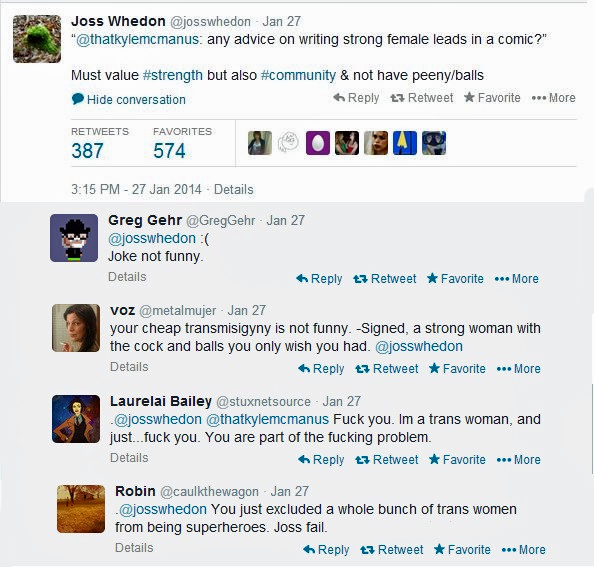 – in which trans women [as well as a few others, I’m sure] tear Joss Whedon apart for answering a question about writing strong female leads with a joke. The problem being, of course, that the joke was trans-exclusionary. GORDON: Current estimates, for the US anyways, are holding at roughly 700,000, give or take, making up just about %0.3 of the population. As Evan and I discussed in our first reaction to the outcry surrounding Whedon, this places people identifying as transgendered at somewhere above the number of folks hit by lightning and lower than the number of people born with more than five fingers on a hand. Point being- it’s a very, very small group. Istvan, “The Accursed Albino”, a member of a traveling freak show. EVAN: This of course led to me thinking about superheroes and comic books, my medium of choice when it comes to discussing representation. One of us made a crack about the number of albino crime fighters out there, which brings us to our topic for today, which is on minority representation in general. GORDON: To summarize, we agreed that the trans population, while unquestionably subject- both in the past and present- to abuse, prejudice, and attacks, seem to be confusing true transphobia (I’m pretty sure that’s a word) with just a general lack of awareness due to how small they are in number. Evan, the American-Asian population currently stands at approximately 4.5%, and it’s a subject you’ve touched on repeatedly. Any thoughts or gut reactions? EVAN: Oof, gut reactions. That’s actually really tough, because while I constantly tout the fact that there aren’t enough Asian characters in almost anything, I believe I’ve thrown that exact statistic around on this blog before. I’d like to posit the fact that American media is far-reaching in scope more than that from any other country, but of course the problem there is that what matters first and foremost is that Americans watch it. Gonna be honest, man, I sort of don’t know where to go with this in a way that I’m comfortable with. GORDON: Alright then, that kinda leaves us in a rough patch. Is there any rule of thumb you can think of that’d apply here? Must be at least X in 100 Americans to qualify reasonably? I know it sounds harsh, but I could start raising my own banner and demand to know where are the socialist characters are on TV. EVAN: Before I can answer that I think I need to ask what the course of action to take would be after finding this magic number. Let’s say that, and I know this is far from true, 3% of people are handicapped, the wheelchair-kind. Does this warrant a single wheelchair-bound character? One thing I’ve read on a number of forums, and that I agree with, is that having a single minority character causes them to represent that minority, for both members and non-members alike. Take for example socialists, which you mentioned. There’s only one and he or she is a villain, or a hero with some sort of contemptible flaw, then what? GORDON: That doesn’t really answer any questions though, does it? Especially not in regards to transgendered people, who will probably still make up an especially small minority in any nation. The issue with having only one or two is what I’ve already presented above. So I guess what I’m continuing to ask is does the number of characters have to be proportional to the minority they are a part of? GORDON: An idea that also crossed my mind. We generally want media to be representative of reality, but that doesn’t mean just having 5 Asians for every 100 characters shown on a TV show. A show set in an upper-class Midwestern city is probably going to be predominately white. A show in a middle or working class area of some town in the Southwest, on the other hand, is going to have a much higher mix. So the question would be, what demographic do transgendered people typically fall into? Something we mentioned in our discussion of the portrayal of homosexuals on TV is that, according to statistics, homosexual couples tend to be more upper class. EVAN: At the very least, I think most larger urban centres [ie. cities, I guess I could have just said that] would be more likely to be accepting of their lifestyle. You are right, though, in that to a point our media has to reflect real life. With that in mind, a show with more than one transgender character might be- would be- super jarring. The flip side of course is having a program devoted exclusively to that particular minority. See: HBO’s Looking, a sitcom featuring three gay male protagonists, or Mighty Avengers, a title which is predominantly Black and Latino heroes. In other words, one way to ensure representation of minorities is to always lump them together in their own thing. GORDON: I wouldn’t say that- after all, shows are most realistic, I feel, when they follow life in being just off-the-walls crazy. I’ve traveled enough of the world to realize that it certainly isn’t impossible that you’ll run into a transgendered zealously Catholic beet farmer. Still, all things in moderation, I guess. I know I’d feel offended if my own subset (whatever that may be) was being included in something only as a token character. EVAN: So would you say there’s a line before we get to the point where shows approach some sort of Glee-esque rainbow of flavours [the show features a pretty broad range of minorities]? GORDON: I’d say it exists, but I couldn’t say that I’d be really able to recognize it until it was crossed. It feels unrealistic, but at the same time it could still happen, right? GORDON: To return a sticking-point of my own, I think it’d be nice to see Arabs portrayed as actual Arabs, not generic brown people or explicitly Indian rip-offs. On that note, with Indonesia actually serving as the most heavily populated Muslim community, it’d be nice to see Muslims portrayed as ethnicities other than Arab or North African. EVAN: You actually hit on that in your post on Christians and how they’re portrayed, and I’d like to back that up by saying how great it would be to have a deeply religious South Korean churchgoer [there are many]. Don’t Trust the B—- kind of had one in Pastor Jin, but that show skirted the edges of reality so often I’m not sure it came off like it was supposed to be believable on any level. Here she is post-plastic surgery. GORDON: “Geek” culture springs to mind. Something more realistic- regular people whose hobbies/interests include science-fiction, comics, and fantasy- not that viciously repellent blackface routine The Big Bang Theory churns out. When it comes right down to it, though, I think it’d be cool to see people doing jobs other than forensic specialist and ambiguous office work. Seeing young people struggle financially and occupationally would be great. 2 Broke Girls started out cataloguing a lot of the different, desperate ways to earn some cash, but it’s so far from that presently it deserves a different name. That’s what the 21-27 demographic is going to really connect with, I think, and the lack of focus on that struggle makes them a minority I think. GORDON: And with that, we’re out of time for today. As always, comments, thoughts, and links to pictures of dinosaurs are always welcome. Ladies, gentlemen, people who would not choose to define themselves, or would choose to identify with alternative identities, good night. EVAN: Or good morning, y’know, we have no idea when you’re reading this. Definitely do let us know any other thoughts you might have about representation of minorities in general [not just trans people, though we definitely turned to them as an example a lot]. And thanks as always for reading! This entry was posted in bizarreness, comics, Culture War Correspondence, lgbt, media, race, religion, television and tagged albino, characters, Culture War Correspondence, disabled, Glee, Joss Whedon, lgbt, Looking, media, Mighty Avengers, minority, race, reality, religion, representation, representative, television, token, trans, transgendered, TV, Young Avengers. Bookmark the permalink. This past weekend, I visited a church in Norwich, CT with a Korean woman serving as Pastor. I wonder too what it means to have a character for the purpose of checking off your census. Surely that is neither effective nor respectful. I think the comment on where shows are located is important–i. e. a LOT of shows are set in either in California or an urban center, yet we see a disproportionate amount of white people. It’s not quite as jarring when it’s supposed to be Wisconsin or something. Two fantastic examples of that are Girls and How I Met Your Mother, both of which take place in NYC and neither of which cared to feature people of colour. I mean, there’s Barney’s brother [played by Wayne Brady] and Hannah’s Black, conservative boyfriend [which was Dunham’s snarky response to criticism, the most unpleasantly self-aware move I’ve ever witnessed on TV], but apart from that no dice, man. The real issue with both shows wasn’t even that they didn’t feature minority leads, it was that the background characters were all predominantly White. It’s like the creators had never visited the Big Apple before. I think my main thought while reading your discussion was exactly what Rosie commented above. I realize that the under-representation of minorities (particularly positive portrayals) is a pretty serious problem, but I think when you go looking for a magic number to guide the people creating this media it just gets into a bad mindset. I don’t think we should so much be looking at the percentage of a minority in the population vs percentage in media so much as we need to look at percentage in the population vs percentage creating the media. If a transgendered person of color were the one writing/directing/whatever a show I think it would just naturally feature more minorities. Also, I had never made the connection to think of TBBT as “nerdface” but now that you point it out I realize that’s why I really don’t like that show. I don’t like being caricatured. I hope you guys do have a talk about that in future. Rosie’s actually Hannah, who you play D&D with every week, if you can believe that. So you would think that minorities creating media would lead to better representation, but that’s proven to be far from the truth in a few cases I can think of. The first would be the Indian-born M. Night Shyamalan, who made the final casting decisions on the horrendous The Last Airbender. The other is 2 Broke Girls, which was created by Michael Patrick King, a gay man; you know that the show doesn’t handle any of its minorities with very much finesse at all. Lastly, I’d encourage you to click the link I embedded when mentioning that term in regards to TBBT. In quite a few ways Gordon falls on the side of those who use it, which you can read in our E&GT on nerd culture.